A favorite Advent tradition with origins in the Hispanic community is the re-enactment of Mary & Joseph’s journey as they looked for lodging in the town of Bethlehem . . . the beautiful nine-day ritual of Las Posadas that is estimated to be at least 400 years old. Posada is Spanish for "lodging" or "accomodation". This poignant La Posada statue, which is lovely for display year-round, serves as a Christmas season reminder of that original journey from so long ago. 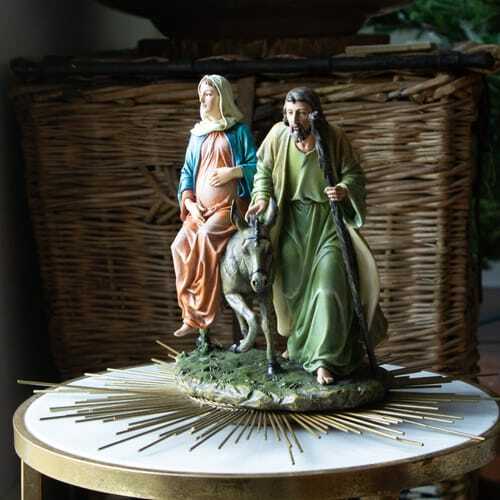 This Holy Family statue introduces the Posada experience to your family, and is perfect for making a spiritual posada in your own heart using Scripture readings and meditations. La Posada figure is just beautiful. The facial features are very pleasing and the expectant Virgin Mary is so unique. I'll treasure this figure. Bought this piece as a gift, recipient was overwhelmed by its' beauty.